China Han Dynasty Activity - HISTORY'S HISTORIESYou are history. We are the future. Instructions: Read the following story from Han times. 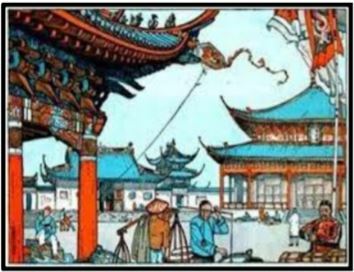 Then, think of the reading from this lesson and try to identify at least 5 things that Wang's story tells us about Han society. Examples might be things like “Confucian education,” “Silk Road trade,” “open borders,” or “emphasis on the arts.” You can print the story and highlight the text that offers a clue about Han times. When you do that, make a note in the margins stating what you think the passage tells us about Han times. A simple man named Wang lived in a village in long ago early Han times. Only a narrow, rough path led to this village, so merchants, officials, and travelers rarely visited. To sell his charcoal, Wang knew he must become the traveler, and make the journey to the city. Wang shouldered his long carrying pole. At each end swung wide bamboo baskets stacked high with charcoal. What present would you like me to bring you, he asked his pretty young wife. "A comb!" she cried. "A beautiful comb like those of the imperial court!" The combs they used in the country at that time were made of wood. "A comb she cried, pointing to the crescent of the golden moon. After a long trip, Wang arrived safely at the city gates. He sold his charcoal for a good price. Made bold by the string of cash he now carried, he looked around the city for his wife's present. The city was so very pretty, with banners of red and yellow and green and blue hung from shop fronts and balconies. It was very noisy with the racket of shop men and shouting buyers. Wang rubbed his chin. What was it his wife had wanted? He had forgotten! Perhaps a pair of leather slippers? Or a warm fur coat? Han Dynasty mirrors were solid bronze. The front could be used as a mirror, while the back had a design. When bright light reflected onto the mirror, the mirror seemed to become transparent. If that light was reflected from the mirror towards a wall, the pattern on the back projected onto the wall, like magic. CLICK to see a magic mirror in action. It was getting dark. The shops would soon be closed. Early in the morning, he had to return to the village. Suddenly, he noticed the moon. It was round, so very round. She wanted something round, he thought. He looked in shop after shop for something to make his young wife happy. Suddenly, Wang spotted the perfect gift. He wrapped his purchase in a piece of cotton cloth and, with only one bow to the shopkeeper, he hurried off. Wang had bought a mirror. He did not even know what a mirror was. He only knew that it was round. For this part of the activity, you will first read a summary of what life was like for one of a variety of workers during Han rule. The worker you are assigned will be randomly generated using the widget below. After you know your number, click on its corresponding button. When you do that, you will be taken to information about your assigned worker. You should print the summary and read the information with a highlighter in hand, highlighting key points in the material as you read. After reading and highlighting your assigned summary, use "Wang and the Perfect Gift" as a model for your storytelling and write a short, fictional biography that tells the class about someone who lived the lifestyle of the worker or social class you read about. Remember, while this is fictional, we are all interested in how you celebrate what life was like for during the Han Dynasty. Create a document in Google docs and name it "Han Bio." Please make sure it is in your shared History folder. Choose a fictional name for your main character (You can add a picture too). Think about how the story of Wang included key ideas about life during Han times. Your story should include key ideas about Han times. Your story must ALSO include at least three facts from the summary that you read. Highlight those three facts in the story you write in Google docs. Once you have edited for proper writing mechanics, post your story on your blog.